And how in the world do you treat it? Not all doctors believe fibromyalgia is real, but to those who suffer from it, there can be no doubt. It can have several causes, but the effects are similar: all-over muscle pain and tenderness, fatigue, trouble sleeping, and often depression and irritable bowel. It’s often not hard to treat. Fibromyalgia exemplifies many of my beliefs about treating pain. It is common, compelling, and sometimes disabling. Fibromyalgia is customarily believed to be extremely difficult to treat, but I don’t believe that, just as I don’t accept that chronic pain in general is inherently treatment resistant. Widespread muscle aching associated with trigger point tenderness. A trigger point is a particular point in a given muscle that is tender to moderate pressure. Normally these points are not sore, although most of us have one or two points that are tender somewhere on our bodies. (Many with severe fibromyalgia are exquisitely tender to touch all over their body. )This type of pain is called myofascial pain. What’s unique in fibromyalgia is the myofascial pain is everywhere. People tell me “my whole body hurts.” Chronic headaches, neck and shoulder pain, and low back pain are the rule. Widespread soreness. Many of my patients describe themselves as sore all over. Others ache but aren’t particularly tender to touch, unless one presses on particular trigger points. When present, tenderness can be extreme, to the point that even the lightest touch is excruciating. Sleep disturbance. Usually this is termed “nonrestorative sleep,” but in my experience, the majority of patients with fibromyalgia just don’t sleep well. It takes a long time to settle down sufficiently to go to sleep, and then they awaken repeatedly during the night, often getting only 4-5 hours a night. One variation is chronic fatigue: sleeping 10-12 hours a day. Whatever the case, patients with fibromyalgia wake up in the morning feeling as exhausted as they did when they turned out the light. They never awaken feeling refreshed or restored, hence the term “nonrestorative” sleep.Occasionally, people develop temporary fibromyalgia-like symptoms just from sleep deprivation. When they catch up on their sleep, the symptoms disappear. Similarly, helping people get more sleep often helps aching. Fatigue. I often ask people their “energy level” on a 0-10 scale, where 10 is normal energy. Most with fibromyalgia are quite fatigued, typically rating their energy levels from 2 to 6 on this 0-10 scale. Weight gain. Many fibromyalgia patients gain weight and lose muscle mass as they become less active. Gaining fat interrupts sleep and can itself cause myofascial pain. Conversely, becoming fit reduces inflammation and improves sleep. Several types of tendonitis, such as plantar fasciitis (pain in the soles of the feet when walking), tennis elbow, and carpal tunnel syndrome. Fibromyalgia isn’t a disease, it’s a syndrome. By this I mean there is no associated pathology or visible abnormality in the structure or tissues of the body. A disease is defined by its pathology. No pathology—no visible abnormality—means no disease. People who have fibromyalgia live just as long as those without. In English, this means if you have fibromyalgia, you’re not sick in the conventional sense of having a disease. You’re miserable. This is an important distinction and has implications for treatment. The fundamental lesson is you won’t hurt yourself by trying out different active treatments, unless you have another serious illness that limits your activity. However, there are two exceptions to the lack of pathology or illness. Many people with fibromyalgia have “small fiber sensory neuropathy.” This means the small nerves serving your arms and legs aren’t working properly, causing burning and tingling. Gabapentin and pregabalin (Lyrica) have been promoted to treat this problem, but they don’t work that well in my experience. Indeed, the studies of pregabalin show you have to treat six patients to help one person. Second, a small percentage of those diagnosed with fibromyalgia actually have chronic fatigue syndrome (CFS). There is some overlap between the two conditions, but usually they’re quite distinct. Fibromyalgia is a chronic pain disorder where aching and tenderness are key. Patients with chronic fatigue syndrome have some aching, but their main problem is debilitating fatigue, which often causes profound disability. Gentle, gradually increasing exercise is the key treatment for fibromyalgia but makes CFS worse. 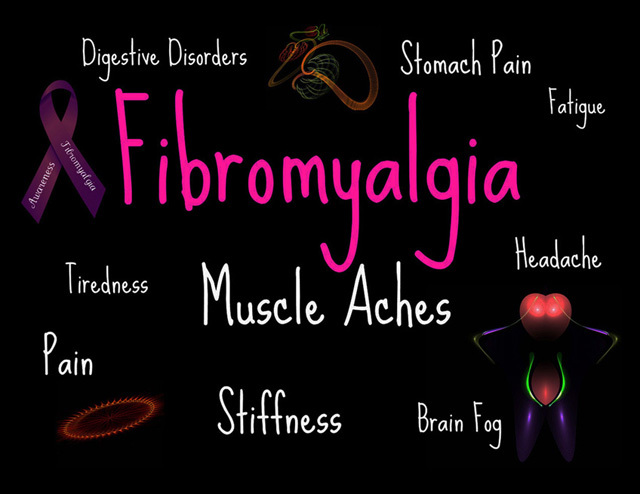 Fibromyalgia usually begins in one of three different ways. The most common onset is following trauma, typically an automobile accident or injury at work. Though a single injury can do it, usually that’s not enough. Many of my patients had one or two injuries from which they recovered fully, but the third one was just too much. One variation on the “starts after an injury” scenario is that you have mild aching following an accident but are basically doing well. Then you change jobs from one where you’re up and moving about all day to a desk or computer job where you never move. The lack of exercise precipitates an extreme worsening of pain. The second common scenario is you develop a viral illness that lingers for weeks, or become ill with pneumonia or rheumatoid arthritis. You may spend a month or more in bed. Some patients with this onset also develop debilitating fatigue, which may become more of a problem than the pain itself. The third common way fibromyalgia begins is it comes out of nowhere. You just begin to hurt. The majority of people with this pattern have severe emotional distress that they’re simply not dealing with. On occasion, fibromyalgia is secondary to another illness such as rheumatoid arthritis or inflammatory bowel disease. Also, certain illnesses can mimic fibromyalgia, including obstructive sleep apnea, polymyalgia rheumatica, and thyroid disease. Older patients should be evaluated for certain kinds of cancer. Be sure you’ve been thoroughly evaluated at least once by a competent physician. Once it’s established, fibromyalgia may be a different process in different patients. In some, emotional distress predominates. Others function relatively normally but are in severe pain. A third group is mostly severely fatigued and complains of “brain fog”: poor memory and difficulty concentrating. The longer I treat patients with fibromyalgia, the more convinced I become that emotional distress plays a predominant role in most patients. Look over the topics on emotional healing to learn more. Remember that fibromyalgia is caused by a system of interacting factors that reinforce one another. In most cases, there is no single “magic bullet” that will cure you. Rather, you should address each of the physical, mental, emotional, and spiritual issues contributing to your pain. Avoid the things that help in the short run but make you worse in the long run. Examples include excessive rest, withdrawing from life, not working, and taking the wrong medications. The most effective treatments help in the long run but may be difficult to get started. Examples include exercise and taking the right medications. Be as active and functional as possible. If you’re going to hurt anyway, you might as well have a life. Wrong medications.Most patients should avoid opiates and sedatives. Opiates are pain killers like Vicodin, Norco, oxycodone, and Oxycontin. Sedatives are tranquilizers like Valium, Ativan, and Xanax. These drugs are potentially addicting. They make many people more unsteady emotionally. In the short term they make your pain better, but over time they are apt to fix your pain in place and prevent improvement. A surprising number of my patients have dramatically improved pain just by stopping harmful medications. Right medications. Many patients with fibromyalgia are highly sensitive to drug side effects, but — although it may take time — most people can find medications that truly do help. The correct antidepressant may be invaluable. Certain relaxers like gabapentin, pregabalin, or Flexeril may be helpful adjuncts. A number of over-the-counter supplements can be extremely useful. One of the most important treatments is exercise, stretching, and strengthening. Your goal is to become fit, flexible, and strong. It’s critical to build up your exercise capability. If you exercise smarter than your pain, you should avoid pain flare-ups. Try to exercise regularly (often several times a day) within reasonable comfort. Recognize and treat depression. If you’re depressed, other treatments for fibromyalgia are apt to fail without addressing this issue. Even people who have never been depressed often feel better if they take antidepressant medications. However, antidepressants fail to benefit a third to a half of those with fibromyalgia. Many people with fibromyalgia have been abused physically or sexually. Others have had to contend with alcoholic or addicted relatives who held authority over them. Still others have a lifelong pattern of caring for parents, spouses, and children without ever addressing their own needs. I’ve often referred people with these sorts of backgrounds to 12-step groups like Adult Children of Alcoholics and Dysfunctional Families, or AlAnon, even when relatives were not alcoholic or addicted. Sometimes, support groups of fibromyalgia patients turn into whining sessions, complaining that no one understands them, how awful life is, and how screwed they are. It’s almost as if the whole group sits on the “Pity Pot.” Pessimism and blocked rage perpetuate pain and fix it in place. In contrast, learning relaxation and meditation may be crucial. Fibromyalgia may be linked to feeling disempowered. Some of my patients feel helpless and ineffective in their lives. The usual cause of this perception is blocked strong emotion. You can learn to get your personal power and authority back. It’s important to work with a physician who can help you figure out the various pieces of the puzzle of why you have pain and how to stop the pain. Fibromyalgia attacked my mother body more than 3 years ago after her knee surgery. She has been in a wheelchair for about six months, and she used a cane for another six months. She did not even know how to walk anymore. We fought the fibromyalgia with a lot of pain pills and tears not until we had to give a try on natural formulas, we purchased a herbal treatment from **** which help her a lot and bring her back to normal again, the herbal formula reverse the symptoms dramatically and she’s totally free from the Fibromyalgia that cost her pains for ages. COMMENT: Promotion of magical cures is especially common in fibromyalgia. I’ve deleted the URL promising yet another one.